The media is one of the most powerful estates of society. They are responsible for making or breaking the image of a public persona, and also for making a persona well known to the rest of the world. They are responsible for spreading news fast and accurately to all corners of the world, and for shaping public opinion. Journalism is much more than straightforward reporting; journalists investigate an incident and attempt to uncover hidden truths, if any. In this article, let us see how journalism impacts the individual, and the society at large. News reports are the sole source of information to us most of the time. If it had not been for the constant presence of the media all of the time in every place, we would never get to know about events occurring in different parts of the world. It is thanks to journalism that people in USA are made aware of terror attacks happening in Barcelona, and that overage of concerts happening in a particular region of the world is broadcast to the rest of the world, and that too in real time. 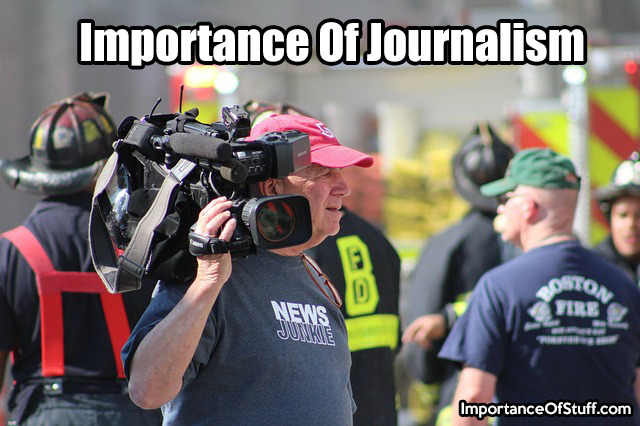 Journalism is different from reporting, so journalists attempt to follow up a story and uncover new details, and keeps the public informed about the same. A countless movies would vouch, investigative journalism forms an important source of information for everyone around the world. Investigative journalists are responsible for the task of following up a story, for which they have to meet with prime suspects and interrogate witnesses, all the while posing as common people with no ulterior motive behind their investigations other than idle curiosity. By snooping around, the journalist is often able to uncover vital information that is key to their story, and even more important in solving a case. While a journalist is not allowed to pass moral judgment or personal opinion on anyone, journalism has a huge humanitarian aspect. A powerful piece of journalistic writing can influence the common people in a way nothing else can. A journalistic report is not an opinion piece, but it certainly provides insights into a matter that is informed, educated, and highly analytical. Thus, the information present in the piece can strongly act toward shaping popular public opinion. Since news reports are our sole source of information most of the time, we tend to rely on the judgments or opinions posed by the media, and our own opinions are formed likewise. For instance, when the news reports make a comparative analysis of the pros and cons of a new law, we tend to lean toward the side which weighs down the scale. Public figures tend to stand on a pedestal as far as the common public is concerned. Despite being so called public figures, every little of their lives is known to us, and what we do get to know is carefully moderated and trimmed and then showcased by their public relations teams. Naturally, the image they usually project is a flawless one. Thanks to journalism, however, and journalism that is today aided by state of the art technological devices, it is no longer that easy to maintain a pristine image. If a public figure makes a grave mistake, it becomes almost impossible to hide it from the general public. Even the most clandestine acts are being uncovered by the journalists. It is not uncommon hear of a sting operation undertaken by a journalist on a public figure, and then unleash a compromising recording of the said personality. On the other hand, good deeds by such public figures, even if it is done anonymously, don’t go unnoticed by the media and thence by the rest of the world. Journalists are key players in bringing about social and political change. By reporting atrocities happening anywhere in the world, they can give rise to mass social outrage against and awareness of certain social practices, which can lead to criminalization of the act. During elections, journalists can turn the direction by publishing pieces that highlight the weaknesses of a certain candidate, and the strengths of the other. That is why it is important that journalism be free from biases and remain neutral and humanitarian in its approach. Journalism has been around for centuries. Down the ages, we have been told of uprisings, natural disasters, manmade calamities, and human achievements by journalists. These fearless beings put themselves in the face of grave danger every day so that we remain enlightened about the state of affairs in the world. In would not be an overstatement to say that they are the ones who have truly contributed toward making the world a global village, thanks to their relentless pursuit of the truth beyond borders. Journalism is really important. The latest example of brave journalists is when Indian CBI court gave a verdict against a self-styled godman, Ram Rahim and his followers started riots. Journalists covered all this putting their life in danger. The goons attacked the journalists but they didn’t back off. This forced the state government to take strict against these goons which was trying to save Ram Rahim before.